USB shield for analog and digital ground? I'm new to Mixed-signal design and I'm having trouble deciding how to connect my digital and analog ground. I'm doing a 4 layer design, so I have a split ground plane. As I understand, since I'm using the same supply the grounds should get together at some point. I'm inclined to use the USB shield as that point where the grounds come together, as I think this would clearly define the returning paths for the digital and analog currents. I'm not sure if this is a good practice, or if there is a better solution. I'd be glad to get any feedback on this. Thanks! Edit: This is not a high frequency design (the main Microcontroller works at 16 Mhz). The different planes are required as the manufacturer states it as a requirement in the datasheet. The power comes from a USB connector that lowers the voltage to 3.3V through a regulator ADP3333. From there I get the "digital power" which comes directly from the regulator and then I get the "analog power" which is the regulator output passing through a ferrite bead. Is it ok to connect both grounds through the USB chasis? Like this? Never ever cross a gap in ground plane with high frequency line! Your layout has several traces going over the gap. Usually a "moat" would actually look like a horseshoe and go around analogue part to keep the digital return currents away while allowing analogue currents to pass normally. If you put it around the digital part, the high frequency return current noise will (still) take the electrically shortest route to a power source which may cross your analogue bits. Here's an idealised situation where the AD circuits are all on the same edge. 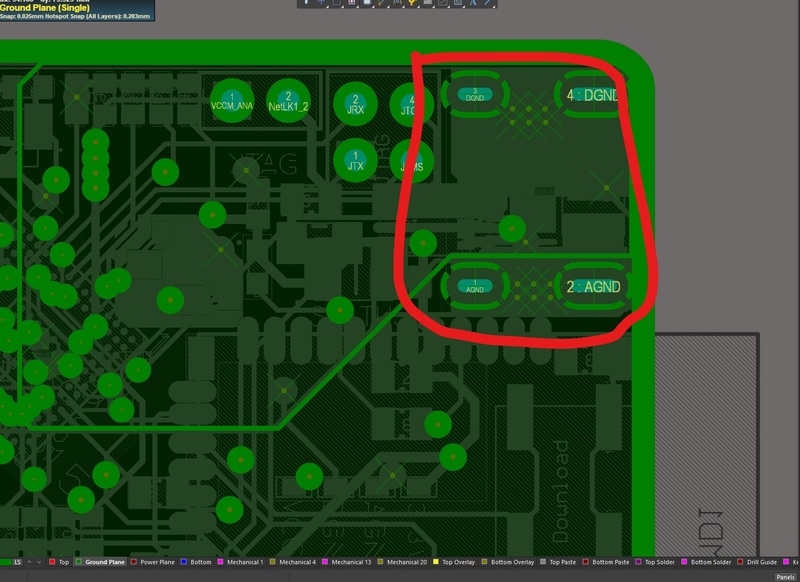 But it'd work the same even if they were in the center of the PCB, DGND would extend all around. Just imagine the image border is in fact your digital ground plane edge with the AGND squares carved out of it. Note that low frequency and high frequency currents behave differently. Basically you have created this situation, digital traces going over ground gaps is not nice. Don't forget you've got several layers to play with. Move digital GND copper to the other side of the board, next to bottom layer. Put digital traces on the bottom layer and now you have nice solid return path for the high frequency noise. Or vice versa obviously. Not the answer you're looking for? Browse other questions tagged digital-logic usb analog ground shielding or ask your own question. Should I really divide the ground plane into analog and digital parts? Filter USB Power noise after Voltage Regulator? How to shield a battery powered instrumentation with USB interface?